This past Memorial Day, Raine and I set out to visit Arlington National Cemetery. We'd visited before, touring the Lee house, paying tribute to the Kennedys and the eternal flame, and watching the changing of the guard at the Tomb of the Unknown Soldier. That visit was sobering and serene, as we tried to find our way among the trees turning up their autumn colors. This time.... this time was different. 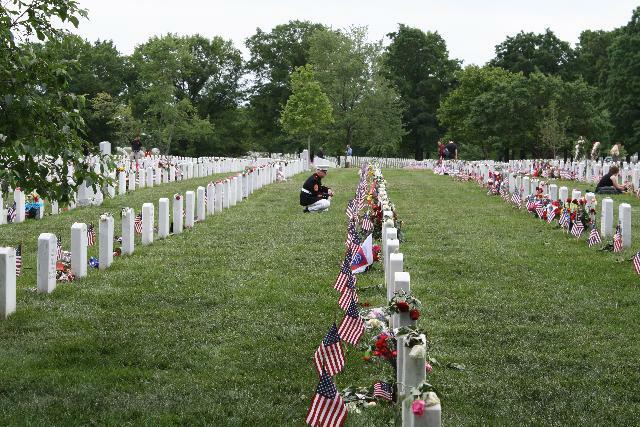 The very nature of Memorial Day is to get Americans to pause and think and remember those who fell in the field of battle. I am fortunate enough to not have had any relative or other loved one killed in the line of duty. 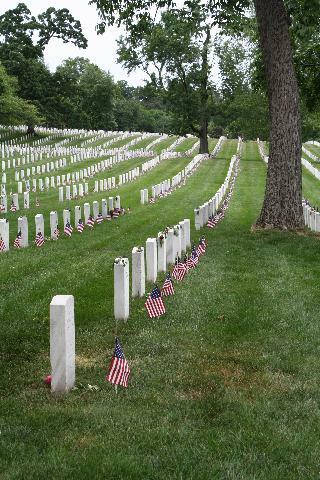 However, visiting ANC on Memorial Day and seeing all the flags is a reminder that many have died for us all. Without us knowing them, without them knowing us - they died for us. Remember that the entire Christian religion is based on this concept. To think that a complete stranger gave their life for my freedom and to preserve my way of life is humbling and horrifying and haunting. The sheer magnitude is startling. You can walk for hours and still see row after row of markers. You can stand in one place and slowly turn and see nothing but markers trailing off into the distance as far as you can see. You can't help but wonder about all those families that lost a son, a brother, a father, a daughter, a mother, a wife. You can't help but wonder about all the lost potential.. which of these might have gone on to be a doctor?... a scientist?... a writer of inspiring novels or music?... The potential loss to the betterment of humanity is depressing. The orderliness and the matching stones all in neat rows can't help but remind you of the soldiers who lie beneath. The similarity to soldiers in matching uniforms marching in formation off to war cannot be denied. We saw graves that had not yet received their permanent stone markers... We saw rectangles of fresh dirt, ready to welcome the shell of another soldier yet to be picked by the Grim Reaper. We saw fields of grass lying in wait of another conflict in a foreign land. It is true that not every person buried in ANC fell in the field of battle. Some are veterans that finally succumbed to the vagaries of civilian life (or the horrors trapped within their own tortured psyches). However, not every American that fell in the field of battle is buried in ANC either - I am certain that there are more lost in battle than there are graves at ANC, which just reinforces the sense of waste. It was President Dwight D. Eisenhower who said "Every gun that is made, every warship launched, every rocket fired signifies, in the final sense, a theft from those who hunger and are not fed, those who are cold and are not clothed". We know that sometimes war is necessary. Sometimes there is a criminal on a global scale that pushes the issue, whether that be Hitler or any other homicidal maniac. It is not unlike the need for police on a local level. When one thinks of the rationale and sometimes outright false flags used to coerce Americans to support a war of choosing, then frustration and anger and the desire to see retribution for these needlessly stolen lives is natural and even required, if our Democracy is to continue. On a civilian level, it is said that the detectives who investigate and prosecute murders are speaking for the dead, as they can no longer speak for themselves. So too must we as a nation speak for the soldiers who died in a war they fought that was based on lies. We as a nation must ensure that it never happens again.